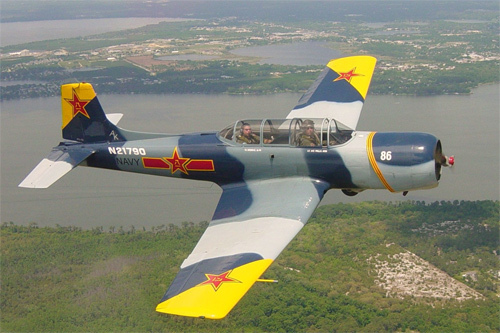 This 1985 Nanchang CJ-6, N21790, is owned by Bill Mills of Flagler Beach, Florida, USA. Photo source unknown. Please contact us if you deserve credit. History: The study of evolution in aircraft design can be as fascinating as Darwin's studies. The development of the Yakovlev Yak-18 and the Nanchang CJ-5/6 provide an example. Revisions of the Soviet Union's basic Yakovlev UT-2M trainer in 1943 included the enclosing of the tandem cockpits and the replacement of a tailskid with a tailwheel. The new variant, designated the UT-2MV, provided the basis for the Yak-18 prototype, first flown in 1945, when the dust of the last WWII battle had hardly settled. With an all-metal structure and mixed fabric/metal covering, the aircraft went into production in 1947, with a comparatively small engine. Built in large numbers as a "tail dragger," the plane was redesigned as the Yak-18U in 1955, with increased wing dihedral, longer fuselage and partially-retractable tricycle landing gear, for use as a jet pilot primary trainer. Despite significantly increased weight, the plane used the same old Shvetsov M-11FR radial engine as the prototype, with predictably disappointing performance. But after it was given a new engine, the 260hp Ivchenko AI-14R radial, in a revised cowling, it served for many years as the primary trainer in the Soviet Union and many client nations, under the designation Yak-18A. There were other variants, sometimes in quantity, such as the Yak-18P, a single-seat aerobatic aircraft that first flew in 1961. Manufacture of the Yak-18 trainer was suspended in 1967 with 6,670 of all versions built, many for export. However, in that same year, production was begun on a significant redesign, the Yak-18T, which was virtually a new machine, a four-place sport/touring aircraft, with side-by-side seating for the pilot(s) and passengers. Production of the Yak-18T continued into the 1980's, with more than 1,000 built. Like many popular aircraft, the Yak-18T has a certain Phoenix-like quality. Thus, the independently operated Smolensk aircraft factory resumed production of the plane in 1993. Built under license in China, the basic Yak-18 was known as the Nanchang CJ-5. Produced at the Nanchang Aircraft Factory from 1954 through 1958, the design showed deficiencies for jet pilot training that led the Chinese to independently revise the basic Yak-18 design to feature a retractable undercarriage, with the main gear folding inward toward the fuselage, and the nose wheel retracting backward into the fuselage. The wings were revised to have prominent dihedral, but, like the Soviet Yak-18A redesign, the CJ-6 retained the 145hp M-11ER radial engine with similarly disappointing results when it first flew in 1958. Revised power, in the form of an Ivchenko AI-14R engine, didn't solve the problem, which called for further redesign of the aircraft. Finally, in 1961, an improved CJ-6A gained approval and was produced beginning in 1962 using a 285hp Quzhou Huosai HS6A engine. More than 1,800 CJ-6As were produced, including those exported to nations such as Albania, Bangladesh, Cambodia, Tanzania and Zambia under the designation BT-6. An armed version, the CJ-6B, was produced between 1964 and 1966, equipped with a 300-hp HS-6D engine, according to some sources. Number Still Airworthy: 200+ in private ownership; Unknown number in active military service. Blue Sky Yakrobatics -- CJ-6 demo flights and airshows. N923YK -- One man's odyssey with the CJ-6. Payne Aviation LLC -- CJ-6 specialty parts. Red Star Pilot's Association -- Pilot's and operators' association. Wild Blue Aviation -- Arlington, WA, USA. Worldwide Warbirds -- CJ-6 sales. All text and photos Copyright 2018 The Doublestar Group, unless otherwise noted.